In 2012, Mass Insight Education partnered with the Evansville Vanderburgh School Corporation (EVSC) to form a Transformation Zone (TZ) with the aim of turning around five chronically failing schools. To date, three of those schools – or 60% – have moved out of the lowest category of performance and all five are on an upwards trajectory. The TZ is a cluster of the five schools led by an internal EVSC office, the Office of Transformational Support, reporting directly to the superintendent. The Office of Transformational Support provides targeted academic and operational support in order to increase student achievement in TZ schools. Staffed entirely by EVSC employees whose purpose is to support the unique needs of TZ schools, the Office of Transformational Support operates as an internal lead partner (a decentralized unit of the school district that brings specific expertise and capacity needed to turn around underperforming schools). MIE supports the Office of Transformational Support by providing tools and expertise with the intent of building capacity within the district. In a May 2014 piece on Evansville’s proactive approach to improvement, MIE notes that the work of the Zone is “paving the way for how systems for support and accountability can work together to improve outcomes for kids.” That’s never been truer than it is today. The lessons gleaned from the Zone are informing the overall improvement efforts of the district. 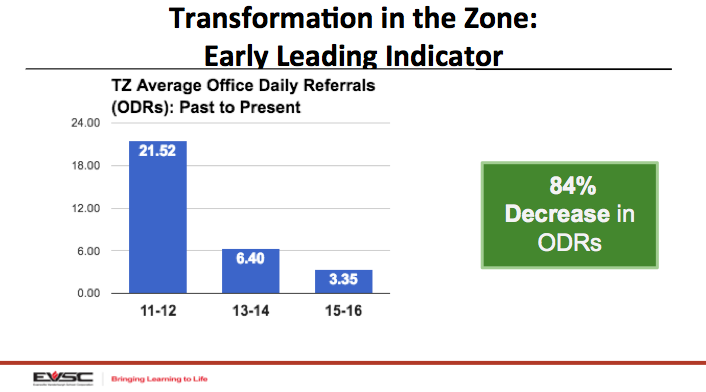 Two years later and with impressive results in Evansville, the Indiana State Board of Education has adopted the Zone model as a state-sanctioned intervention option. MIE has since partnered with two other Indiana districts while additional districts have found ways to capitalize on the option. And last week the Evansville Vanderburgh School Corporation’s board approved a fifth year of partnership with MIE. 1. Clustering schools sets the stage for differentiated support and networked learning. The TZ clustered five schools with a common set of challenges. Beyond enabling the EVSC to provide more targeted support to the unique needs of each school, the cluster invites learning opportunities across and between building leaders and classroom leaders faced with similar challenges. The Office of Transformational Support accelerates learning across schools through facilitating frequent opportunities for leaders to learn from each other about what solutions are working. Recognizing the power of this model, the EVSC tapped MIE’s consulting services in clustering the district’s 39 schools into five attendance districts (clusters of schools serving students in a common geographic area) and one cluster of high schools. Each cluster is now led by a Director of School Supports equipped with a team dedicated to serving those schools’ unique needs; Directors facilitate frequent Professional Learning Communities, or PLCs, of principals in order to foster networked learning and accelerate gains across schools. Just 6 months into the implementation of Directors of School Support, 88% of all EVSC school administrators reported their DSS was supporting them with their personal leadership practices. 2. Data-driven decisions are best made with information from both leading and lagging indicators. The bottom line for those of us working in education is – and has to be – student learning. And when supporting persistently failing schools, there are a lot of pistons to align before the student achievement needle ticks up. This means that measuring only gains in student achievement runs the risk of giving imprecise data about the efficacy of a given initiative or intervention – that is, student achievement data lags behind other indicators. That’s why EVSC’s Office of Transformational Support measures earlier performance indicators, like attendance, office referrals, and the instructional rigor of teacher-generated assessments. These metrics facilitate precise feedback about the efficacy of an initiative, unlocking more nimble support. Measuring leading indicators has far-reaching implications for how the district rolls out initiatives. For instance, MIE is supporting the EVSC to train department chairs to coach teachers on rigorous instruction. While our ultimate goal and lagging indicator is improved student achievement, we’re measuring initial gains in the frequency of observations, the precision of feedback, and the feeling of trust between teachers and their coaches in order to streamline support. 3. Principals benefit from the support and accountability. MIE finds that most leaders benefit from a coach. Principals in TZ schools are coached to look at a variety of school data, and they receive annual non-evaluative school assessments conducted by MIE. The Office of Transformational Support provides training and support as the principals lead School Improvement Planning that addresses the root causes of gaps in performance. At least biweekly, school improvement plans are monitored by the TZ principal and a dedicated director or strategist from the Office of Transformational Support. Together, they problem-shoot obstacles, ensure that the plan remains on track, and assess the impact of the plan. This has worked so well that in the spring of 2016, the EVSC extended their partnership with MIE to include aligned training for all Directors of School Supports overseeing a cluster of schools. Consistent with the research from the Wallace Foundation, sustained support for principals leads to their own professional growth, and improvements in the school. After 6 months, 93% of EVSC school administrators reported these Directors of School Support were supporting their development of monitoring systems aligned to their School Improvement Plan goals. Here at MIE we remain impressed by the proactive approach in Evansville. That the EVSC Transformation Zone has led to such impressive gains for its member schools is admirable. A major bonus is the lessons learned along the way – lessons that the cluster model has made possible through the opportunity to incubate and pilot innovations with a quick data-driven feedback loop. The capacity of the district to improve its own schools is ever expanding.